On our drive to West Virginia for post-Christmas celebrations with my family we stayed in Winston-Salem, NC (one of only two hyphenated towns in North Carolina). While in Winston-Salem we walked around downtown in the bitter cold and found Soups, a Vietnamese restaurant specializing in pho (that's Vietnamese for soup). 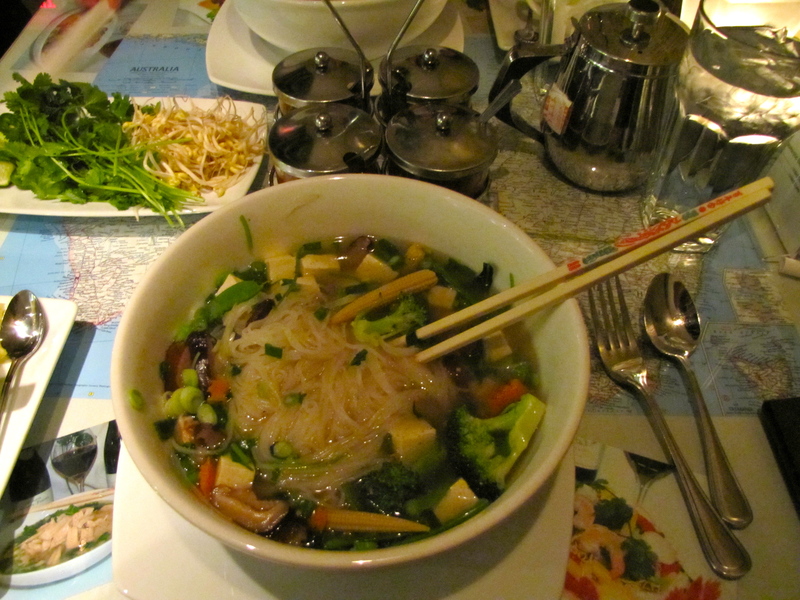 Since it was cold and we like Vietnamese food and what we wanted to eat was in the name of the restaurant, we went in. When we walked in, the first thing that struck me was how normal it was. No oversized Chinese lanterns, weird gold-leaf wallpaper or Pier 1 fake asian decorations. The second thing that struck me was how small the place was. Not small in a two-tiny-booths-and-the-window-seat kind of small, but more of a cozy kind of small. Maybe 20 tables, all pretty close together, half of which were full. Then I noticed we were listening to Sirius 80s on 8 rather than that odd Asian Bluegrass many eastern eateries tend to play. We were taken to our table and given the menu. Like the restaurant itself, Soups' menu is small. And it's mostly soup. 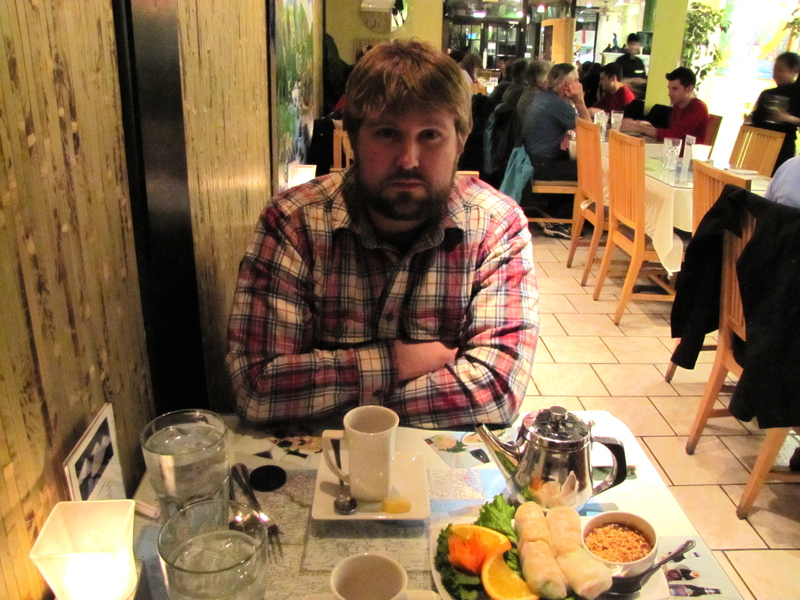 Lauren and I settled on an appetizer--spring rolls--and ordered a pot of tea to go with our soup. While we waited for our food, we entertained ourselves by looking at the map of Australia that was pinned beneath our glass tabletop. I think you can see Perth just south of the easternmost spring roll. 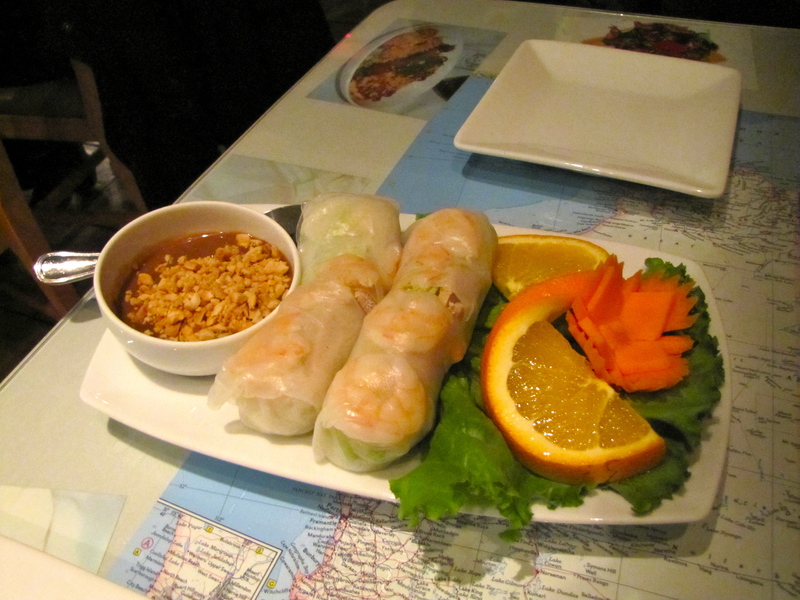 The spring roll was passable at best but the sauce was quite good. Lauren and I found the shrimp briny and not very fresh tasting. The whole thing would have been better they had been left off altogether. Which brings me to a question about local food. Winston-Salem is only 4 hours from Wilmington, why did I eat a frozen shrimp? Why wouldn't a restaurant owner have someone make the drive twice a week and buy 100# of shrimp fresh off the boat? I digress. So, the spring roll wasn't very good, but the soup was. I had a vegetarian soup with tofu and I have to say it was very tasty even if it did lack umami. Lauren went for the Vietnamese twist on the classic chicken noodle soup with the Chicken Noodle Pho. It was also quite flavorful and did have some of the umami mine lacked. 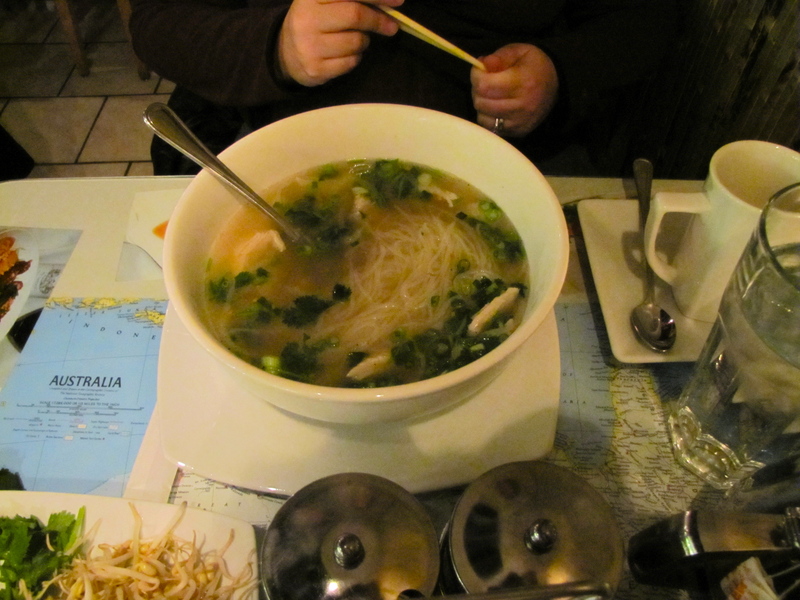 Take a look at the size of those bowls of pho. We couldn't finish them. They're Gojira sized. I think that's why they were $13 each. My take on Soups Vietnamese Pho and Grille is this: the soup is good but overpriced; the appetizer you can do without; if you go, share a bowl. I think next time I'm in Winston-Salem, I'll skip Soups and go for New Town Bistro, unless I get a better recommendation, that is.